Tanks and Everything Armored By TankNutDave & Co.
Raptor_q’s World Of Tanks Wiki Guide to Stop Playing Like A Noob! South Africa had been fighting in the Angolan Bush War AKA the South African Border War, from the mid 1960’s to the late 1980’s. It saw the apposing belligerents backed up by the Former USSR and Cuba. The war set the requirement for some more modern and effective Armoured Fighting Vehicles, which lead to the indigenous development and production of such vehicles as the Casspir, Ratel, and G6 Rhino 155mm, which were all wheeled AFV’s. South Africa had learnt that wheeled AFV’s were not susceptible to the sandy desert conditions, like tracked vehicles were. It meant that the wheeled vehicles were more mobile and more ideally suited for dashing across the boarder to make strikes against the enemy. It also meant the vehicles could drive to their target areas, rather than being delivered by transporters or railway like tracked vehicles are. Land mines were a great concern to the S.A.A., and it was found to be quicker and easier to replace a damaged wheel than it was to replace damaged track’s. The development of the vehicle started during the 1980’s as a replacement of the Eland (Mk7) armoured car and its design incorporated lessons learnt from the SADF’s boarder wars. First vehicles were delivered in 1990 to the SADF and in total, 250 were manufactured. OMC were the overall manufactures who built the hull and inserted the Denel turret, which was delivered completed. 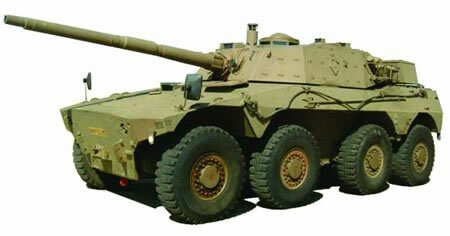 The turret, which was manufactured by SA firm Denel Ordnance houses the Denel 76mm main gun. The decision to use a 76mm instead of a 105mm was because SA neighbours lacked any serious armour that Denel’s high quality munitions couldn’t penetrate and also that the vehicle could carry more 76mm rounds than 105mm rounds. 48 x 76mm rounds are stored in the vehicle. The main gun can be elevated from -10 to +20 degree’s. It can fire APFSDS-T and HE-T. 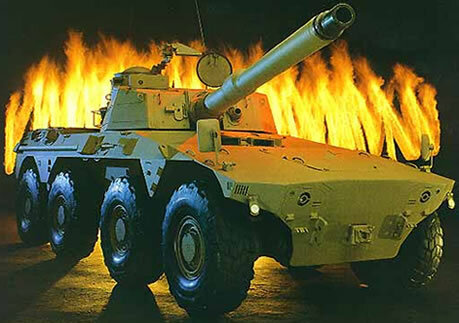 The turret drive and main gun stabilization (provides a fire on the move capability) is all electric which reduces the vehicles thermal signature and risk of injury of crew if the armour is defeated compared to hydraulic turret drives. The turret has a full 360 degree traverse. It has a coaxial 7.62mm MG for close encounters and a roof mounted 7.62mm MG for anti-aircraft. It carries 3600 rounds of 7.62mm. The vehicle has a modern Fire Control System, which includes laser range finder and wind sensors. Gunner has a passive night/day sight and the commander has a periscope day sight. He also has a raised cupola with 360 degree vision around the vehicle. The vehicle is constructed of steel and offers protection across the front of up to 23mm rounds. It has 2 x banks with x4 smoke grenade launchers on each and can generate a smoke screen by injecting diesel on to the hot exhaust. The inside is equipped with a fire suppression and NBC system. Engine is a 563hp V-10 diesel. The driver can select either 4×4 or 8×8 with power assisted steering on the front four wheels. Driver is located centrally in the front of the hull. Gunner sits front right in the turret with the commander behind him and the loader is on the left. A upgraded model with a new turret housing a 105mm rifled main gun capable of firing all 105mm NATO rounds was developed between 1990 to 1994. It has not been purchased by any other nations.